We can supply market-leading hose & tubing to suit a variety of processes & fluid transfer requirements. 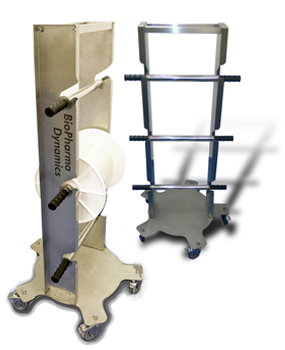 ￼The BioPharma Dynamics spool stand is an innovative solution which allows the easy unreeling of tubes. Enabling technicians to move the tube spool effortlessly across lab areas. This mobile spool stand makes the storage of large to medium sized spools easy. It allows for convenient access around any lab and is fully equipped with wheels and brakes. Produced from Stainless Steel, these spool stands can be customised to suit your lab requirements. To ensure we meet you requirements, we specify the tubing for your application and then determine your consumption and supply a spool length that best matches your needs. The tube spool can then be adapted to suit the number of spools you are using, or to suit the environment you are working in.